Tom Hardy carries the entire movie Locke on his own for 85 minutes sat in a car. 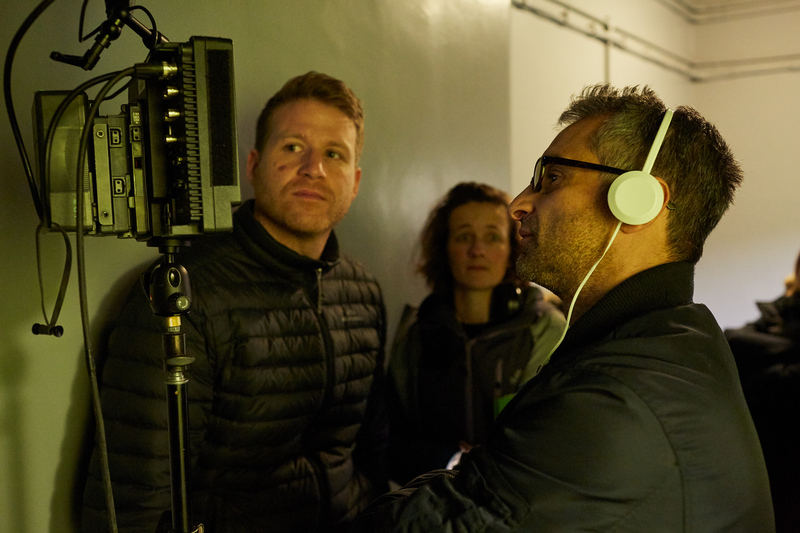 It was bold, evocative and original – an approach to film-making that I really admired. 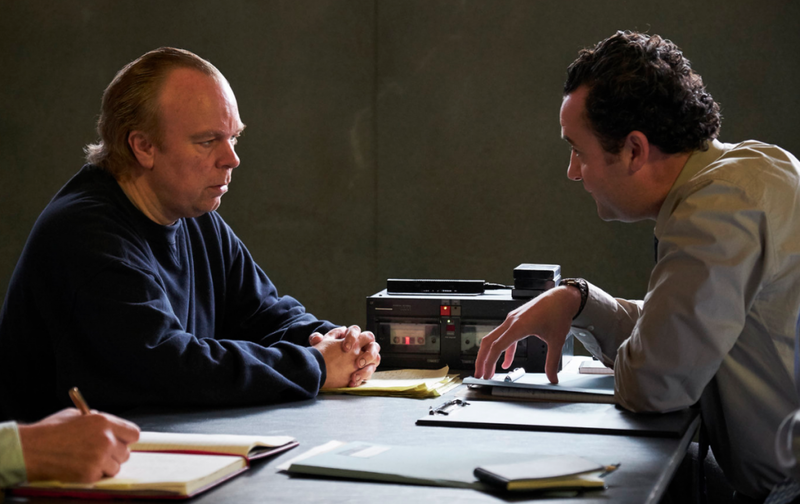 When Channel 4 gave me an opportunity to write and direct a low-budget drama two years ago, the result was The Watchman, a thriller set in a single location, a CCTV control room, with one actor: This is England’s Stephen Graham. Both films were like plays – one for cinema, one for TV. This concentrated, singular and claustrophobic form of story telling is the antithesis of contemporary mainstream TV drama with its lavish sets, multiple locations and sprawling casts, but in a very crowded and generally conservative market, being distinct has a currency of its own. When Pete Beard and I set up Story Films we wanted to play with form. The Interrogation of Tony Martin is the product of two years of work. This time, we’ve made a drama that largely takes place in a police interview room, featuring four actors, a table and chairs. The constraints are not just cast and location. This is a real story; an actual police interrogation which we decided to dramatize using only the words that were spoken by the suspect and detectives at the time – it’s a ‘verbatim drama’. The police interview is the chapter in a major crime story that we’re normally shut away from. Taking a viewer into this space becomes privileged access. Inside the four walls of an interview room, there are secrets and truths that remain hidden. We wanted a case that already had profile, where the audience might be familiar with the headlines but not the detail. It wasn’t long before we started to talk about Norfolk farmer Tony Martin, an intriguing and inscrutable man who found himself at the centre of a crime that divided public opinion, a story about something very fundamental: the right of a homeowner to defend himself and his property. The issue is as relevant today as it was when Tony Martin shot dead a teenage burglar in 1999. There were two burning questions: Would this particular police interview fit the demands of an unfolding TV drama? How would we obtain the transcripts? After a hunt across the Norfolk Fens, Pete and our producer Emily Turner finally tracked down Tony Martin. His unpredictable, nomadic lifestyle made him rather elusive – to this day we’re still unsure where Tony Martin actually lives. We do know he has a mobile phone (unhelpfully, it is usually turned off). There were several visits to Norfolk over many months. Tony seemed curious about the film we were proposing, although generally cynical about the media. The idea of a drama where we’d be using his actual words spoken in the hours after his arrest seemed to appeal. He has an unwavering belief that he was justified in doing what he did that August night at his home Bleak House and that people should understand why. We’d found Tony but locating the transcripts was much more complicated. His solicitor didn’t have a copy; he’d given the transcripts to Tony. Tony had since lent them to an author and hadn’t been able to retrieve them. We tried his barrister – no joy there. Autumn became winter, winter became spring, and the Fates weren’t smiling. What the transcripts give is an authenticity and purity – a picture of ‘Tony Martin, the man’ that a writer couldn’t get to in the same way. There is also a distinct quality to hearing the actual words as they were said in the moment. As a last option, Tony said he was happy to make an application for the papers under a Freedom of Information request. It was worth a try. Several weeks later a large package arrived – 230 A4 pages – transcripts of the interviews that took place 19 years earlier. We started to read. Many suspects will maintain their right to silence, but Tony Martin isn’t one of them. In that police interview room he talked, talked and talked some more. The police weren’t looking for a confession: Martin readily admitted he’d shot his gun. No, this interview focused on the notion of self-defence and reasonable force. Had Martin acted reasonably or was this a case of murder? Having read several police interview transcripts, you know instinctively if it has the elements of an unfolding, dramatic story. This interview was not only dramatic but also incredibly layered. Over three days of questioning it revealed different versions of Tony Martin. He was vulnerable, emotional, animated, strident and belligerent. The interviews are very biographical. In the film, Tony Martin, played by Steve Pemberton, tells the police “I can only do it, explain this, [by giving] the whole history of my life living at Bleak House” – and that’s what he did. What the transcripts give is an authenticity and purity; a picture of ‘Tony Martin, the man’ that a writer couldn’t get to in the same way. There is also a distinct quality to hearing the actual words as they were said in the moment. Memories are coloured by the passage of time, but transcripts speak for themselves. Perhaps this takes us closer to the truth and closer to the characters? The phrase ‘based on a true story’ has become a cliché of the crime drama. This is a true story – word for word. 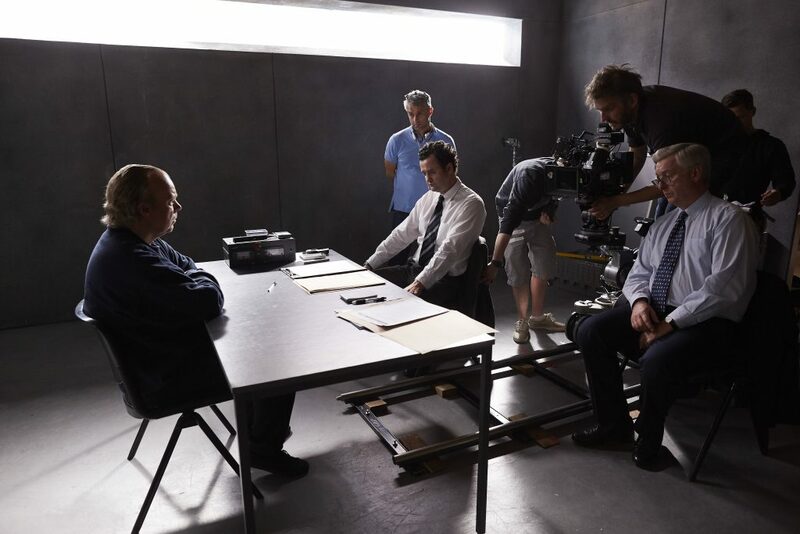 The Interrogation of Tony Martin airs on Channel 4 on Sunday (November 18) at 9pm.